Check in to DoubleTree by Hilton Hotel London – Tower of London and experience a stress-free stay with a combination of warm service, contemporary comfort and the very latest technology. 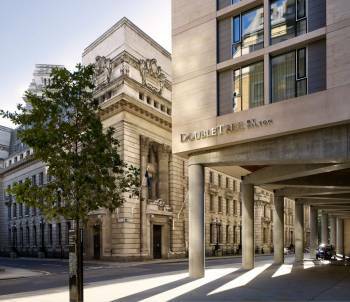 Situated in the heart of the City of London, this hotel puts you in easy reach of one of the world’s financial hubs and the City’s most iconic tourist destinations. Take advantage of the iMac entertainment system in every bedroom. Whether you need to kick back and relax or get some work done, our bright contemporary hotel is the ideal location. Count on a warm welcome and a signature DoubleTree chocolate chip cookie. DoubleTree by Hilton Hotel London – Tower of London and its staff have gained a lot of experience with arranging meetings, conferences, trainings and all sorts of events. Offering conference facilities including 10 meeting rooms the hotel has been used as a conference hotel in London on a regular basis. Please also have a look at the other conference hotels in London which we are proud to present to you.